Browse through our free recipe listing, written by experts to bring restaurant quality right to your home! 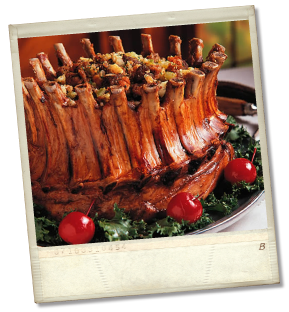 Stand the pork rack up and curl it around so that the two ends meet; be sure that the thick meaty part of the pork is on the inside. Secure the roast by tying it twice around the outside of the roast with twine. When the pork is cooked to the proper doneness - an instant-read thermometer should read 140 to 145 degrees F - remove it from the oven. Carefully transfer the pork to a serving platter and cover it loosely with aluminum foil. Let the pork rest for 20 to 25 minutes. Bring the pan juices to a boil. Taste and re-season if needed. Blend the veggies if desired to create a smoother sauce. I also like to leave them in. Brown meat in shortening. When almost brown, add the onions to the pan and brown a little longer (5 minutes). Add remaining ingredients and simmer for 2 hours, stirring ocassionally. Add water as necessary to keep from becoming too thick or sticking to bottom of pan. Serve over spaetzle. Delicious! Trim all the fat from beef round. Place the roast beef on top of the trimmings and coat the beef well with more of the seasoning mix. Drizzle olive oil on top of the roast and pat the oil over the seasonings. Place into the preheated oven on lowest rack and roast approximately 1 1/2 to 2 hours, uncovered, until the internal temperature registers *130 degrees F on an instant-read thermometer. Remove from oven and let stand about 20 to 30 minutes before carving. 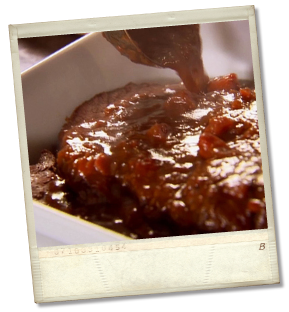 This roast can be used for sandwiches, thinly cut or thickly cut and served with beef gravy, if desired. *Cook's note: 1 1/2 to 2 hours (rare) 140 degrees F for medium, 160 degrees F for well. In a medium saucepan over medium heat, mix all ingredients together. Stir until it forms a nice thick glaze. 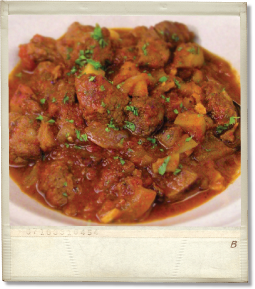 2 racks of lamb, "frenched"
Recipes courtesy © 2013 Television Food Network G.P. All rights reserved.